Set Backs Come but Be of Good Cheer! It does not matter what setbacks may come, God promises that He will take everything satan has meant for evil and turn it around for our good! We must learn to lay hold on what was stolen from us spiritually, physically, financially by commanding using our authority in Christ! When we go through times of humiliations, God is our vindicator and Judge as he knows all things. He is our very present help in times of trouble. In prayer I saw a bald eagle that had been in some altercation and ended up on the ground with a broken wing. The eagle became easy prey for predators. The eagle was so vulnerable and it could not fly. Then suddenly a number of older and stronger eagles began to surround the eagle that the broken wing. Then I saw other eagles and I heard a loud sound and understood inwardly that this sound was the many waters and the prayers of the saints rising up as incense rising on the variable levels and wind currents of the Word of God. What I saw next was a corporate effort of folding and binding up the wing to the eagles’ side. Although the eagle felt so vulnerable and afraid, the greater eagles that were sounder in their efforts had seen this fallen eagle and their prophetic response and presence brought forth lasting tranquil peace and direction about this situation. While the other eagles of greater age and expanse of vision, all knew what had to be done so they surrounded the eagle with the broken wing, and hovered and these began in unison to flap their wings lifting the eagle with a net into even higher place. The greater in strength began to lift the broken wing eagle up higher and much higher. 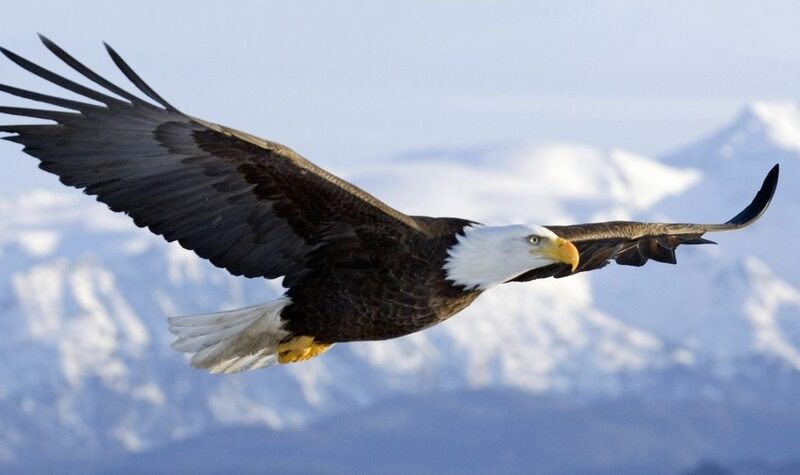 As I beheld this vision, the eagles that had seen the fall took the wounded eagle up to a very high cleft in the rock. It was in the cleft of the rock that there were no predators and in this place of safety the eagle had to be placed in that cleft of the rock for a time and to receive a time to heal and commune with God. “I hearkened and heard, but they spake not aright: no man repented him of his wickedness, saying, what have I done? every one turned to his course, as the horse rusheth into the battle. Yea, the stork in the heaven knoweth her appointed times; and the turtle and the crane and the swallow observe the time of their coming; but my people know not the judgment of the LORD,” Jeremiah 6:6-7 KJV. Author newbeginninginternational.netPosted on March 6, 2019 Categories ProphecyLeave a comment on Set Backs Come but Be of Good Cheer! Remember, God is the only one who can vindicate, validates and approves. Remember Joseph! I was saved when I was 7 years old and baptized. However, as I grew up, I lived a very bad life as a teen and then once I came fully to God in 1981 as an adult, I began to change. I was raised pretty much Baptist, but didn’t find the depths I craved in God till 1983, when I got baptized by fire in the Holy Spirit and I was radically changed. I had got connected with a friend whom I met at the base Chapel, and she would tell me things that happened in her life as a child. I would just sit and listen in amazement, as she would share with me things God would do in this life NOW! I didn’t know God could be so real. Her parents are deliverance ministers in the Church of God; the one based in Cleveland TN. Anyway, she introduced me to the Holy Spirit/ Ghost baptism, and to make a very long experience short, God literally showed up in my house on the third night when I fasted and prayed for the very first time, and oh my good God, did HE show up! I had no idea about any of this! I was so innocent and had no idea why a puffy white cloud showed up in my home and the presence of that weight of His glory, oh my! Neither did I know what price it would cost. I experienced the Shekinah and had no idea what it was, it just scared me, but WOW, did God baptize me with fire! Of course, later, The LORD taught me about the Glory of The LORD when His visible presence would come in the form as a cloud in the Bible. It wasn’t long after that when I was in prayer and The LORD told me he called me as a minister. I saw that and told him, “I can’t do that! I’m a woman! Well, not long after my radical experience, my husband became a very heavy weapon against me and was used by the enemy. But true to form, God always turns everything towards our good. All of those years in the refining fire I continued to say, I could never be a minister. My marriage of 25 years to a pastor was made final in 2006, but the effects of that marriage were very hard and long lasting. However, what was worst, was in pouring out my life to people in the Church whom I thought were my friends, who loved me, and believed in me. I shared everything with them. They knew me and I never imagined such betrayal could happen. All of the times of bearing my soul were turned against me and in my rejection, bitterness took a hold of my soul. Bitterness defiled me and I pulled away like a wounded animal. I was trying to survive and when anyone who got too close, I would lash out! No one understood. Yes, they would use the scriptures and yes, the scriptures are right — but I was in no place to receive them, for my wounds were so raw, nothing soothed them. So I resorted to isolation. We must learn to ask God for a word fit for use and in the proper season…..
God knew all of this and He had not left me. He was waiting on me all through the whole scenario. Like Job’s friends’ had good basic instructions, with good intentions, but had no experience in that kind of suffering regardless of the weight they carried, sometimes people just need to learn to shut up and refrain from speaking or playing God, when they have no idea what you go through. While we learn to sit in silence with death, trauma and suffering, it can become such a ministry experience. When we identify with someone by just being there in action, only using words if necessary, can do so much more. Yes, satan set me up big time, and I don’t deny that I am not religious, pretending that I am some sort of perfect person. I am not lying about it, and I believe what the Bible teaches about suffering, especially the sufferings of Jesus Christ and of Paul! Yes, I had a truck wreck and had physical wounds, very deep emotional wounds, and very deep marital wounds, and very, very deep and critical ministry wounds. It was during this short period of time where everything hit me all at once and it had caused me to be mortally wounded. I couldn’t function, my whole life had been hurled into the air and when it landed, caused zillions of slivers of crystal everywhere. I did my best to hide it and the best I could do was to sweep up the pieces of my shattered heart and put the dust and pieces in a little sack around my neck, because I had no idea what to do with it and it was the only place I could wear it. Some wear it on a sleeve, I wore mine around my neck. “And they that heard it said, who then can be saved? And he said, The things which are impossible with men are possible with God. Then Peter said, Lo, we have left all, and followed thee. And he said unto them, Verily I say unto you, There is no man that hath left house, or parents, or brethren, or wife, or children, for the kingdom of God’s sake, Who shall not receive manifold more in this present time, and in the world to come life everlasting,” Luke 18:26-30 KJV. In my rejections, the wounds were gaping so deep that my heart was shattered into zillions of what were fine crystal glass fragments and though some had tried to minister to me, there was no one who could minister, because just as that crystal vase breaks and if we try to fix it, we end up getting cut from doing it. God is the only one who can heal a shattered heart. Yielding from that depth of shattering experience was so hard and so vast and it is so out of human control to master it. For my traumas, sufferings, and death, I was so shattered that God had to heal me from the inside out. So actually, pulling away was a good thing for me, because I had finally found in silence what would be my cure. Yes, I found my cure, but The LORD was the only one who made it possible, and it took time. When we look at our humanity, we can become overwhelmed and many times it is impossible to understand. However, with God all things are possible. Forgiveness, bitterness, grudges, and the ability it has in keeping us bound to old wounds must be yielded to the Master of our Journey. I came to a place in my life where I assumed it was mastered, but I found out with shock is was not. When I faced my own bitterness, unforgiveness’, my own self-hatred and the actions it caused to myself, it was a long rocky road. I had to learn walking it out; day in and day out. Sometimes it was a faint whisper, moment by moment in pleading with God….. I learned that I had a very hard image of me and when me fights me, we cancel each other out. I believe there are a lot of you out there like that. You struggle with forgiving you. I am convinced there are so many walking wounded all around us. We must learn to minister from the position of death. We die so He lives. It is when we finally experience death to all our life experiences, then we are transformed to live in newness of life. It is then that we transformed like a caterpillar to butterfly. We are totally changed in a brand-new way! I will continue learning as I grow. Learning to pull away quickly, to regress then to progress. I am daily learning to forgive, release them and let them go but realizing in many instances it is much harder is to forgive me, release me and let me go! I am also seeing how The LORD is changing my desires and physical things as he is stream lining me as I am getting smaller in all sorts of ways. Not having things that hold us down is important to The LORD. I am certain he knows what is doing because I sure don’t! I have learned to relish my silence and peace. I am learning so many things I cannot describe that he has and is doing in me. I desire HIM and I seek no honor or glory. People online have experienced a little of who I am in God, but I find so much emphasis is on titles, instead of the death those titles bring. I shy away from those. I pray God keeps me humble, broken and lowly of heart, for I only desire his heart. Yes, years ago God said this and that, but now, I decrease. If he wants to title something, that’s His business. He is very able to do so. However, I have learned so much in silence and in waiting to let God make room for my gift. To fully know, we don’t try to figure it out. We must just know, if He turns on the button, He can do whatever he desires to do with us. Shy away from people’s admiration and quickly walk away from flattery. Ruin is on the lips of the flatterer. We must yield to time and training in silence; be still and know, and to study to be quiet and work with our own hands, these will create great strides in our lives. However, how many decades do we want to wander and flounder? As we wander through the wilderness, are we hoping to find another spring or cave experience with God? Have we despaired of life itself? What hit me in Alaska when I pastored my 2nd Church with my husband? I was involved in a truck wreck, in separation and divorce, and in my mental state, as I fell so deeply into depression, I couldn’t pull myself out of it. Prior to that happening, I was prideful that I was in control in my life, and you see, I had to maintain the image of a ‘together person’ in Church, when I couldn’t, and the ones I thought would never forsake me, did. These were the very ones who broke bread together and were supposed to help those who have been wounded, or given up on. But suddenly within a 3-month stint, I found myself hospitalized with a total breakdown. I could not stop crying. I cried so long I didn’t know how to shut it off. You see, when my X walked away from God, it wasn’t just a separation in a relationship, it was also from the people of that ministry, to whom I was so close. I felt this morning that “the vein” was going to burst, and it has to burst. I won’t say much, because you my dear, may have been treated badly, even seriously! God is the judge and HE will hold them accountable for every word and curse they spoke about your life. However, you must know that when one part is bursting at the seams, it affects us all. There will come a day, maybe today, when God will vindicate you publicly, and by that time you will have already been healed and well-seasoned from it all, that you will minister with such grace, mercy and compassion, for the depth of your experience makes you a deep pool, your well within you springing up to life as an artesian well! I keep hearing this nursery rhyme, “There was an old woman who lived in a shoe..” I see greatness coming up from a small place, which will yield great results in the Kingdom and benefits in boundaries, stream lining your life and ministry. I’m not saying that “old woman” is a bad thing, but a Church of experience, who has realigned the fit of the old, but abounding it to so many new. Children are a blessing from The LORD and you will see many Spiritual children, grandchildren and great grandchildren and great, great grandchildren! We leave a heritage to our offspring! No matter what the limitations of the shoe may seem, God said you will have what you and they need! Then they too will grow out of, and go out seeking their own shoe for the fit of the Master! The steps of the good man are ordered of The LORD! “But, one of the young men told Abigail, Nabal’s wife, saying, Behold, David sent messengers out of the wilderness to salute our master; and he railed on them. But the men were very good unto us, and we were not hurt, neither missed we anything, as long as we were conversant with them, when we were in the fields: they were a wall unto us both by night and day, all the while we were with them keeping the sheep,” 1 Samuel 25:14-16 KJV. As I prayed this morning, I heard this…. However, in this House of Foolishness and Senselessness, I see percussively what is happening! Nothing is beyond My view! There shall be a literal wall, but before anything manifests in the natural it must be built in the Spiritual realm! I AM moving on behalf of those who are standing in Warfare for this nation! This is My Wall and there is a Gateway of My promise, and her torch shall shine once again stand as a beacon of hope to this nation! This Great Nation Will Rise and Shine again, and be a beacon of hope again, and in bringing divine guidance in Her gates and in her great strength she shall function under My Sovereign Supreme, Justice! Do not look at the multitudes of other nations, I have always had a remnant, and I have always had Israel! Yes, be encouraged beloved in standing in the gap, for as you press in you are one,” says The LORD! I see the Capital in Washington DC! I see the Hand of God come and smite the Capital like a man would swat at a fly. “This is but a light thing to Me, but you must learn that I AM not separate from My Will and Word! I watch over My Word to perform it and I never go beyond that Task or Word! I AM not separate from My Will and Word! It’s three in One in harmony that brings agreement! For it is through great pressure that a child is born, and it is through the hot fire that shapes the instruments of My power! My Word is becoming flesh in you,” says The LORD! “STOP! Hear the Word of The LORD! Wait for MY sound in the Mulberry Trees! Now be patient, establish your heart towards your goals, for I have Arisen. Don’t you sense and know the time of My Arising? I send you great courage and confidence this day! The people of this nation and those of other nations in alliance and league with Me, shall see and know the Truth and the Truth will make them free! I AM sending strength to those God-fearing men, women and children that stand in the Gap for this Nation! As America goes, so shall those alliances with her! Those of you who are awakening to the evening news can see this utter folly and senselessness! I have heard their cries, as they have awoken the God of Harvest, the God of Sabaoth due to the lies and fraud. I have heard the cries of those who have entered My ears! I have heard you! Your labor isn’t in vain for I have heard it all,” says The LORD, “and I AM moving in this hour in such a way that brings Great Glory!!! As this House of Foolishness and Senselessness continue to bring railing accusation against My Anointed, My Word and MY Will in the United States of America; as David was humiliated and thought to resign due to great discouragement because of his son; just as the seeming majority have been criticizing him severely and though there have been great numbers of campaigns against My chosen, I shall rise once again and I will take one like David to face that giant! This man is like a wild stallion that refuses to be broken and once again he will not use the political armor even if he must stand with a sling and a stone! Give up this negative spread of information about those in an abusive way, remember I change not. But the Sovereign Lord Says, “Pick back up your tool in hand and weapon in the other, for I shall Arise in your midst and My enemies are being scattered! For those who touch you, touch me the apple of My eye, and once again MY vision shall be seen in this great land and shall flourish,” says The LORD! The LORD spoke that your labor has not been in vain! “In the midst of Chaos, Rule and War, I AM arising in thy midst but remember to count and continue in the cost of those who must pray, decree and declare My will into this nation and the world!!! Then shall come My wisdom, knowledge, understanding, retribution, resolution, revolution, restoration, release and revival,” says The LORD! ”Shall not the Judge of the whole world do what is right? Yes, the time has utterly come that those who hate Me and those who follow those who follow after those who are mine, shall be utterly scattered before them and shall FLEE before Me! As I Arise, My enemies smoke screens are unveiled, and like wax melts before a fire, so shall the wicked perish in your presence for you follow My presence, purpose and plan,” says The LORD of Hosts! Let God arise, let his enemies be scattered: let them also that hate him flee before him. As smoke is driven away, so drive them away: as wax melteth before the fire, so let the wicked perish at the presence of God. But let the righteous be glad; let them rejoice before God: yea, let them exceedingly rejoice,” Psalms 68:1-3 KJV. Nabal accused David of being a runaway slave and spoke out against MY anointed, who had protected all of his interest! Had it not been for the young man that ran to Abigail there would have been no man left alive by morning. READ: 1 Samuel Chapter 25. “Beloved stop now! Be still, and really listen; really seek and listen to the I AM, the God of Abraham, Issac and Jacob! Hear the reminders beloved! Bring to remembrance the former things when you were first illuminated! “But call to remembrance the former days, in which after ye were illuminated, ye endured a great fight of afflictions,” Hebrews 10:32 KJV. “However, right now it is imperative that you stop, be still and listen! Don’t focus on the winds of adversity, no matter what it looks like or sounds like or feels like! Be not moved when everyone around you picks up their shallow roots and runs from the effects of tribulation! Watch how they run! For it is during tribulation that separates the boys from the men! During tribulations, watch how they pick up their shallow roots and run away! However, you have and are learning how to remain rooted deep in My Faith in My Spirit! For the entrance of My Word brings light! Your feelings are not your measurement of faith! Feelings are unpredictable like doing things on a whim. As you remain grounded, rooted, and immovable, others who have watched you will take notice as they will stand and remain immovable!!! You not only train and equip but your words don’t compare the voice that speaks through your actions and character! Trust that I have planted you and you shall prevail! You heard and felt the winds, you feel the quake and you saw the fire, but I was not in any of them. But I shall speak in a better way! I shall manifest when you learn to trust in faith as I speak in a still, small, voice when you are still, small and quiet. My beloved, I have prepared you in such times because you can shall never teach faith unless live and learn your lessons! As you stand, you shall not be uprooted during these winds, waves, storms and tribulations! You must learn to depend absolutely without any feelings! To stand in this hour you must have deep rooted and raw faith! Yes, you will feel the effects of the winds, waves and sounds, in your body; you may lose your leaves but my branch won’t be broken! In your transitioning, you will withstand as never before, and your roots grow deep when winds blow strong! The waves, the quakes, the shakes remember to remain focused on I AM! You must understand the strategy of demonic media propaganda! You have never passed this way before! You must master your own ship using your own helm to direct, focus, and remain in faith! I have not changed my mind about President Trump, your government and nation! Be aware of all false manipulative alliances whose mission is to take over and control, to prostitute your gifts and benefits from your life! The enemy can use anyone who is not where they should be. We all fall and miss the mark in many ways but you must understand the hour you are in! The enemy is coming against the people of God in an unprecedented manner! When the enemy comes in like a flood The LORD shall lift up a standard against him! It is not the time to play games and neglect the LORD’s presence and lose your first love affair with God. We must return to our first love! Make no alliance with evil, turn your head away and do not look, keep yourself pure! Be careful what you allow yourself to be a part of or come into alignment or agreement with! Be diligent and on guard and be mindful in what you allow in your gates! You must guard your eye gate, your ear gate, your mouth gate, and every spiritual gate, every portal, every entrance, spiritual, emotional, and physical! Guard yourself concerning all communications! Remain steadfast! The first line of defense; you must guard and pray over all methods of communications! The enemy’s first attack will come to try to cut you off from the head in communications, who is Christ! God is not schizophrenic! He has not changed his mind! Stand in faith, don’t give in to liberal threats! Do not bow out, bend or burn! Fully trust in raw, pure, unequivocal faith! Stand even in their midst as a pillar that is solid and set your face like flint! By having pure faith with God comes through many storms and tests! I never change for I AM the same yesterday, today and forever more. Get quiet before me! Be still and know that I AM God! Do not cave in and lose your confidence! Cast not away your confidence for you shall be rewarded!! You must remember that you are seated in heavenly places by Christ Jesus. Keep your eyes focused, stay militant, and work with your tool in hand on your job and keep your weapons sharp. Spar often, for iron sharpens iron! The warfare is intense and it shall continue to increase but fear not, for I have many who have not bowed their knee to Baal,” says The LORD of Hosts! “For I AM the LORD, I change not; therefore ye sons of Jacob are not consumed,” Malachi 3:6 KJV. 6 For I AM the LORD, I change not; therefore ye sons of Jacob are not consumed,” Malachi 3:1 KJV. Author newbeginninginternational.netPosted on February 2, 2019 Categories ProphecyLeave a comment on Stop Now! Be Still and Really Listen!